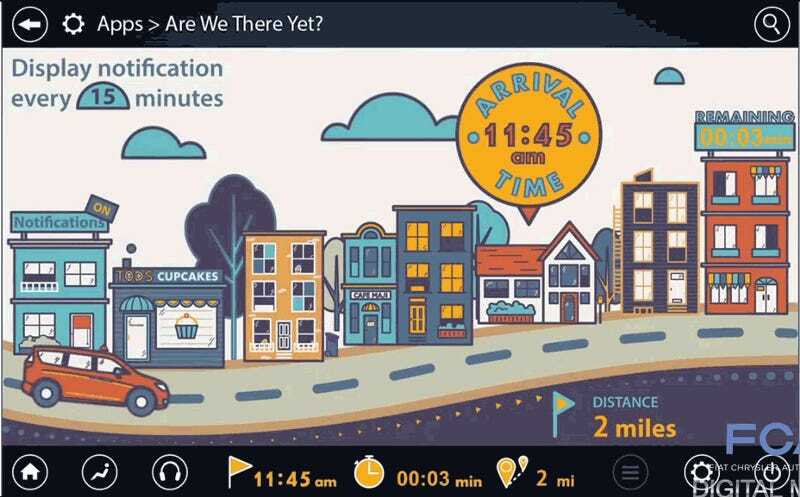 New App Finally Shuts Up Kids Asking "Are We There Yet?" Chrysler’s latest revision on their minivan (no longer called the Town & Country; it’s now the Chrylser Pacifica, for some reason) is a pretty surprising rolling room of tech–a hybrid system, 360° cameras, a vacuum cleaner–and it includes a modern tool to solve one of the family roadtrip’s most traditional annoyances. Stuff like this, of course, are what sells minivans, which are usually purchased because you have kids, and you need a nice, comfortable, fun mobile room so you can haul your kids around before deciding it would just be easier to chloroform them, roll them in carpets, and throw them in the trunk. One of the included apps on the Pacifica’s rear seat Uconnect theater whatever thing is something called Are We There Yet, which is sort of like that airplane-trip progress map you’ll find on the little seatback screens on long airline flights. It lets the kids know where they are, and how long they have left to go before they get there, in a fun animated way. All in the hope that, for a few glorious moments, they’ll stop repeating, interminably, monotonously, ‘are we there yet’ until you want to drive right off a goddamn mountain. This is the sort of feature that saves lives. We’re looking for more details on the other apps; if it actually does come with games, that will make the Pacifica the first production car ever to come with built-in video games.